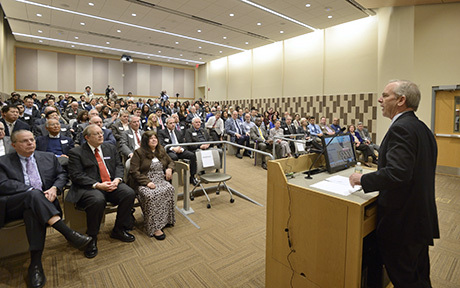 The New York Fed president routinely meets with local community and business leaders to gain a deeper understanding of regional economic conditions and inform the policy making process. Engaging directly with various stakeholders also allows the New York Fed president to better identify ways for the New York Fed to support the Second District. Explore past outreach trips below. 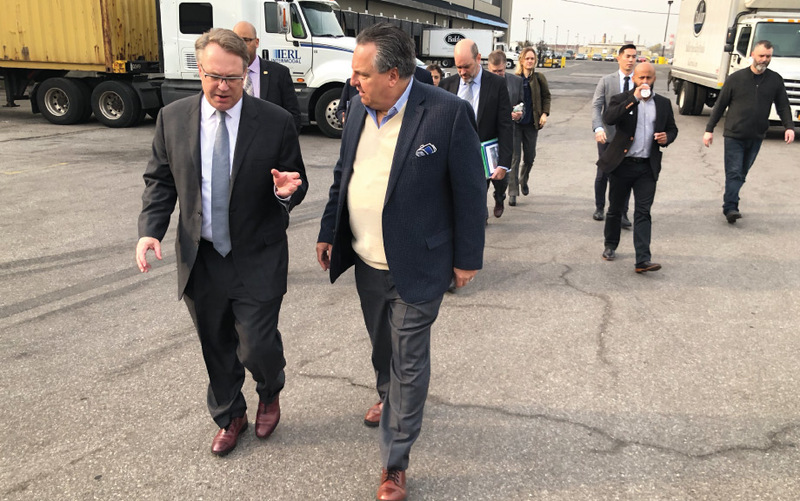 President John C. Williams tours Baldor Specialty Foods in Bronx, New York, with Michael Muzyk, president of the company, on November 19, 2018. Learn where President John C. Williams went and who he met with while on his regional visit to Bronx, New York, in the Twitter feed below. President John C. Williams, center, tours Northland Workforce Training Center in Buffalo, N.Y., on Sept. 6, 2018. Learn where President John C. Williams went and who he met with while on his regional visit to Buffalo and Niagara Falls, New York, in the Twitter feed below. What’s interesting here [in Western New York] are the challenges because of the region’s strong manufacturing past—and thinking how do you leverage that, and what are going to be the long-term growth drivers? 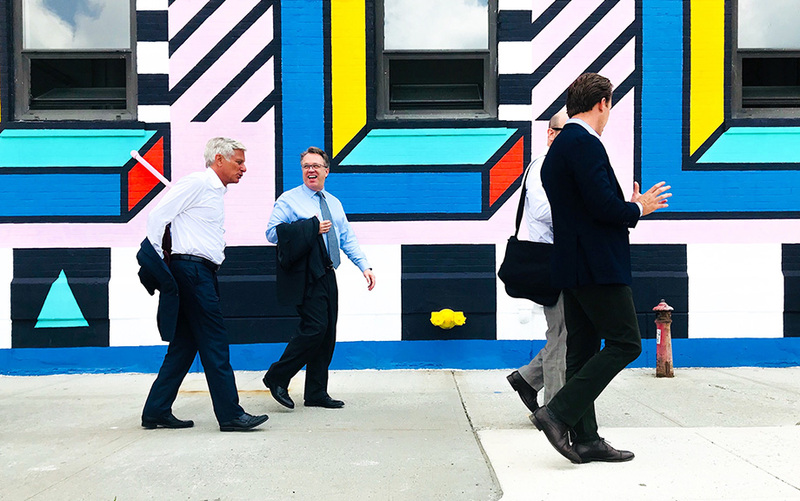 President John C. Williams, second from left, tours Industry City, a waterfront warehouse complex that has been redeveloped for light manufacturing, retail, and office space in Brooklyn, New York, on July 11, 2018. Learn where President John C. Williams went and who he met with while on his first regional visit to Brooklyn, New York, in the Twitter feed below. What should economists be spending their time on? Mostly risk scenarios. This is critical to policy making. Learn the lessons from the past and apply them to the future. 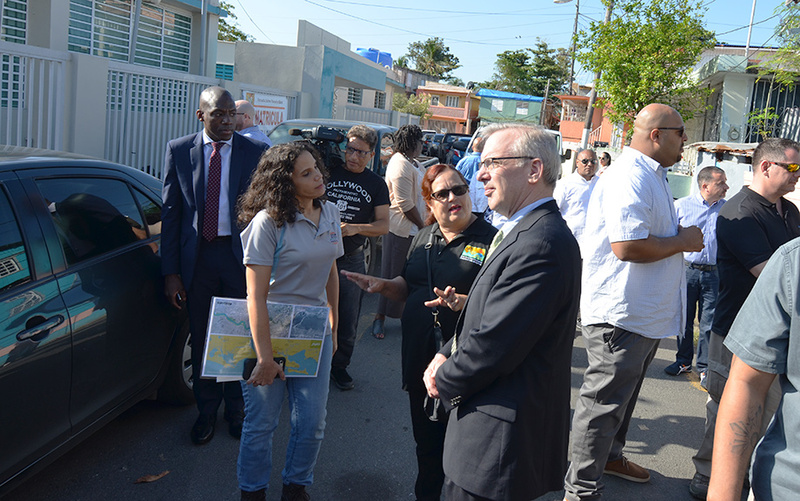 President Dudley tours Puerto Rico’s Caño Martin Peña neighborhood with Lyvia N. Rodriguez-Del Valle, Executive Director of Corporación ENLACE del Caño Martin Peña, to learn about recovery efforts. In the first regional visit of 2018, President Dudley and New York Fed staff traveled to Puerto Rico and the U.S. Virgin Islands (USVI) to meet with local nonprofit, government, and business leaders to understand economic conditions and recovery efforts in the aftermath of Hurricanes Irma and Maria. The devastation of these storms resulted in significant setbacks to areas facing fiscal and economic challenges. The two-day visit began in St. Thomas with a dialogue with community leaders about ongoing efforts to assist the elderly, families, and children impacted by the hurricanes, followed by a visit to a housing development completely destroyed by Hurricane Maria. President Dudley then met with U.S. Virgin Island’s Governor Kenneth Mapp to learn about the territory’s recovery efforts. The visit was capped off with a meeting of local business leaders who highlighted their efforts to restart their businesses and return to normalcy. Later that afternoon President Dudley continued his visit to the region by traveling to San Juan, Puerto Rico to meet with Governor Ricardo Rosselló to learn about the Commonwealth’s recovery from Maria. President Dudley then held a dinner with nonprofits and technical assistance providers dedicated to assisting small business owners and entrepreneurs. The next day, President Dudley kicked off the morning by meeting with Puerto Rico’s labor leaders, followed by a visit to Caño Martin Peña to learn how the community is combining various strategies to improve the living conditions and recover from Maria. President Dudley then spoke with members of the Puerto Rico Chamber of Commerce about the economic impact of the hurricane. In the discussion, he noted that despite the severe impact of the hurricane, economic activity has begun to recover. Following the event, President Dudley met with housing foreclosure prevention experts to learn about the island's housing issues and afterward met with local banking leaders. It’s really important not to be seduced by that strong recovery in the immediate aftermath of the disaster... We would expect there to be a bounce in 2018 as the construction activity gets underway in earnest... It’s important not to misinterpret what it means, because a lot still needs to be done on the fiscal side and the long-term economic development side. Over two days in October, President Dudley traveled to West Point and Albany, New York, where he engaged with leaders in business, education and government as part of the New York Fed’s ongoing efforts to assess economic conditions in New York State and the broader Second District. At West Point, President Dudley met with the leadership of the U.S. Military Academy, discussed with cadets the role of the New York Fed and the importance of integrity as part of an economics class, took part in a faculty roundtable, and joined cadets for lunch in the mess hall. The following day, President Dudley began his tour of the Capital Region in Albany with a fireside chat with members of the Business Council of New York State and other community leaders. He then met with the leadership of the Empire State Development Corporation to learn about the state government’s efforts to address the economic challenges facing the region. The last stop in Albany was the State University of New York, where President Dudley met with leadership to discuss the role of higher education in economic and workforce development throughout New York State. Albany’s economy has been performing well, having grown steadily through the recovery and continuing in the current expansion. It has benefited from the stability provided by Albany’s role as a center of state government and the numerous higher education institutions in the region. In addition, New York State’s significant investments in nanotechnology since the early 2000s have provided a boost to the region’s manufacturing sector. To that end, the trip concluded with a site visit to semiconductor manufacturer GlobalFoundries, in Malta, New York, where President Dudley sat down with executives to learn about the company’s recent innovations and what its growth means for the regional economy. 9:15am Breakfast & Fireside Chat with the Business Council of New York State Inc. The educational community can partner well with the business community. That can generate a lot of gains in terms of employment opportunities. President Dudley visited the Southern Tier region of New York State in early July. The Southern Tier, which includes the city of Binghamton, New York, and borders Pennsylvania, has struggled economically as a result of manufacturing losses and a population decline. During his visit, President Dudley met with community and business leaders, Binghamton University staff and the Broome County Executive. Through these meetings, he learned about key challenges facing the area. These ranged from economic to social welfare issues, including difficulty in attracting skilled talent, the increase in heroin use and drug-related crime and the lack of transportation and child care options. In addition, a recent win for the area—$500 million won through the Governor’s Upstate Revitalization Initiative—has led to concerns and stalled projects as the region is still waiting for the funding. While the Southern Tier is facing its share of challenges, there are bright spots. Business leaders pointed to an increase in commercial construction and development in recent years. 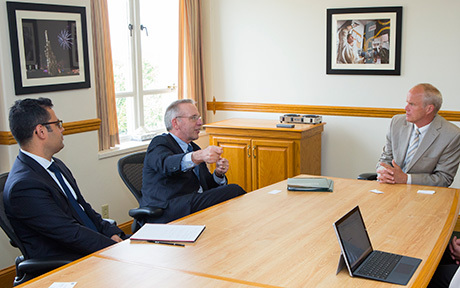 President Harvey Stenger of Binghamton University, the largest employer in the area, told President Dudley that the university is committed to filling its role as a catalyst for economic development. These efforts include a University Downtown Center for the College of Community and Public Affairs to enhance its collaboration with local agencies as well as several new incubators to encourage entrepreneurism and innovation and the Innovative Technologies Complex. Leaders of the Southern Tier Regional Economic Development Council also detailed their “Southern Tier Soaring” initiative, a plan that focuses on redeveloping the region’s identity. Since the initiative began in 2011, the council has taken on 334 projects, resulting in the creation of 4,050 new jobs, retention of 12,441 jobs and $892.5 million in leveraged investments. President Dudley ended his trip with a lunch meeting to discuss hydraulic fracturing, an energy extraction technique widely known as fracking. While Dr. Alex Nikulin of Binghamton University explained the latest research, Bruce McClellan, a practitioner and expert in the field, detailed improved safety measures and potential economic benefits. We need to do a better job in retooling and reskilling workers. 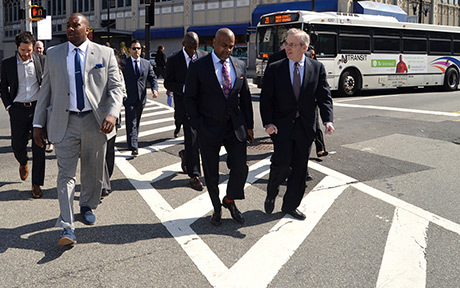 President Dudley kicked off his 2016 Regional Visits with a trip to Bridgeport, Connecticut, to learn about the economic gains and persistent wealth gaps across Fairfield County—where Bridgeport is located—as well as the challenges the city itself is facing. While Fairfield is one of the nation’s most affluent counties, it is also one of the most divergent in income. Median household income in Stamford is 65 percent higher than the national average, but in Bridgeport the median income is 22 percent lower. There are some encouraging signs in Bridgeport, however, including new development along the waterfront at Steelpointe Harbor and Main Street, an upturn in population since 2000 and an above average labor force participation rate. Following the speech, President Dudley visited the WorkPlace—a workforce development organization—to learn about the Platform to Employment (P2E) program, a five-week preparatory program aimed at helping the long-term unemployed get back to work. He engaged in a discussion with several current and past members of the P2E program to hear about their challenges securing employment and how the program was helping them build skills and confidence. Finally, President Dudley toured a mobile classroom at the American Job Center, a joint effort among state, regional and local organizations to ensure a seamless delivery of workforce programs and services. Next, during a lunch conversation with business leaders, President Dudley learned about business challenges facing the region, as well as the impact from declining employment in manufacturing and finance. To wrap up the day’s events, he met with leaders from three organizations for a conversation about the state of affordable housing in Bridgeport and state-wide. The leaders spoke about the challenges facing low- to moderate-income residents, including the availability of affordable housing stock as well as income inequality and gentrification. Fairfield County can leverage its proximity to the New York City job market. While most residents of Fairfield County rely on job opportunities locally, many residents commute to jobs in Manhattan. So the strength in New York City’s economy should be of significant help to Fairfield County. 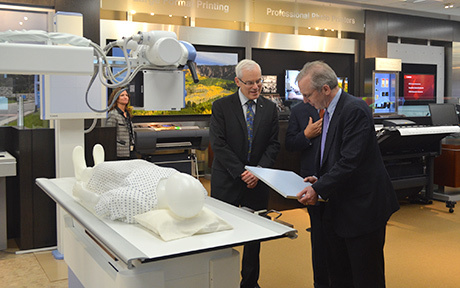 President Dudley, right, tours the headquarters of Canon USA, a large employer on Long Island, during the last visit of his 2015 regional tour. While overall economic conditions in Long Island have improved since President Dudley’s last trip in 2012, this year’s visit was a reminder that not everyone is benefiting from these gains. “Averages can be deceiving,” President Dudley noted, recognizing the challenges facing many people and communities in Long Island. President Dudley began his day with a breakfast meeting at the Long Island Community Foundation, which brought together leadership from area foundations. Key issues identified by the foundations included a lack of opportunities for minority and immigrant communities, a lack of affordable housing and outdated infrastructure and transportation systems. Afterwards, President Dudley spoke with a group of lenders to hear their perspectives on local conditions and trends in small business lending. The group agreed that Long Island is a difficult place for small businesses to make inroads. Next on the agenda was a visit to Hofstra University to speak with students. Joined by Herman A. Berliner, Dean of the Frank G. Zarb School of Business, President Dudley addressed the national and regional economy, as well as the importance of these outreach trips. “The economy is not just about statistics and numbers; it’s about people trying to advance their lives and achieve their goals. Coming out to the community to understand those challenges and opportunities is important to informing what we think about the economy and how we think about what is appropriate for monetary policy,” he explained to the Hofstra crowd. President Dudley then engaged in a roundtable discussion with the Nassau and Suffolk County Executives and members of the Long Island Regional Economic Development Council. The group highlighted several challenges facing the region, including high housing costs, the need to invest in STEM fields and an aging population and loss of young talent. On a positive note, the group also agreed that the council has been a catalyst for good in Long Island by making it easier to identify key issues affecting economic growth and to discover investment opportunities. The trip concluded with a visit to Canon USA, a large employer on the Island. President Dudley toured their showroom and new facilities, and sat down with senior management to discuss Canon’s vision for the future. 2:30pm-3:00pm Tour of Canon USA, Inc. The economy is not just about statistics and numbers; it’s about people trying to advance their lives and achieve their goals. Coming out to the community to understand those challenges and opportunities is important to informing what we think about the economy and how we think about what is appropriate for monetary policy. 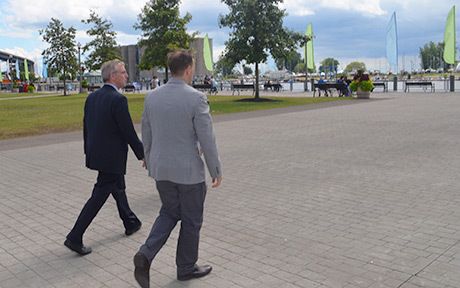 President Dudley, left, tours Canalside, a waterfront development project in Buffalo's Inner Harbor with Aaron Bartley, executive director of PUSH Buffalo. 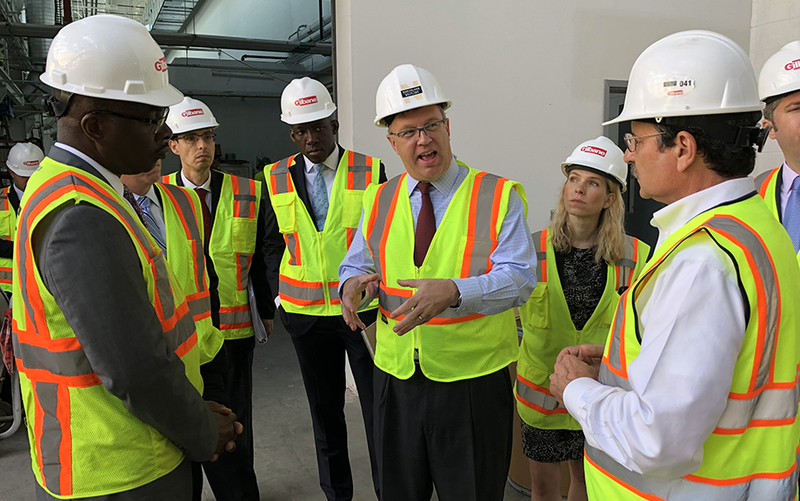 Local leaders in Buffalo and Rochester, New York state’s second and third largest cities, showcased recent economic development projects during President Dudley’s visit in August. Since his last trip to the area in 2013, community stakeholders have worked to solve some of the region’s economic challenges through data-driven tools and key investments of private and public dollars. Those investments have resulted in several projects, showing that Buffalo, Rochester and Niagara Falls are on their way toward reinvention and revitalization. The day-long visit began with President Dudley delivering remarks on the regional economy and the importance of workforce development. Speaking before the Rochester Business Alliance, President Dudley noted that Rochester has been going through a prolonged period of economic transformation, which has resulted in a more diverse and stable economy. Furthermore, he underscored the importance of workforce development. “A skilled workforce that is matched to the needs of employers is also necessary for the economy to grow and prosper,” he said. Later, President Dudley engaged in a roundtable discussion with small business owners in various industries in Western New York. Among many of them, a primary concern was the inability to access capital to expand and promote their businesses. Afterwards, the team spoke with the leadership of Monroe Community College and discussed their data-driven approach to developing tools and programs that address the most pressing workforce development needs in the Greater Rochester area. After a 75-mile drive west the team arrived in Buffalo for the second half of the trip. Buffalo has experienced significant economic growth in recent years, highlighted by the redevelopment of the inner harbor area and several construction projects, including the new SolarCity plant—a $750 million project that is expected to create 3,000 jobs. As a result, the city’s unemployment rate has fallen and the population decline has slowed. However, the city is still grappling with a 31 percent poverty rate, a challenge the team observed while touring the city with Aaron Barley, executive director of PUSH Buffalo. We need to help workers build the skills necessary to adapt to change. This makes workforce development a top priority for everyone involved: workers, their employers, their communities and the public sector, as well as education and job training institutions. We all need to share in the responsibility of helping people increase and maintain their skills. President Dudley, right, with Newark Mayor Ras Baraka at Teachers Village. Photo courtesy of Tehsuan Glover, The Newark Times. 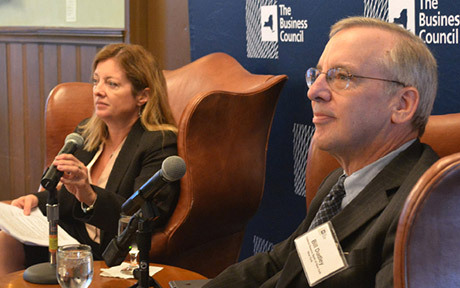 President William Dudley kicked off his outreach visits for 2015 in Northern New Jersey, where he met with business leaders, public officials, representatives from local community and economic development organizations and the academic community. This is the third time that President Dudley has visited Northern New Jersey since his regional outreach visits were launched in 2010. His visit started with a stop at the New Jersey Performing Arts Center, where he gave a speech on the national and regional economy. He also toured Teachers Village, a public-private partnership with the goal of revitalizing downtown Newark, and Stevens Institute of Technology in Hoboken, where students now have the opportunity to earn a minor in Media Engineering and fill a current skills gap in the region. In addition, President Dudley met with Jersey City Mayor Steven M. Fulop, small business owners and nonprofit small business lenders. With both commercial and residential rents, not to mention sales prices, high and rising in Manhattan, northern New Jersey has an opportunity to capitalize on its widening cost advantage by attracting companies and residents that value an urban location. 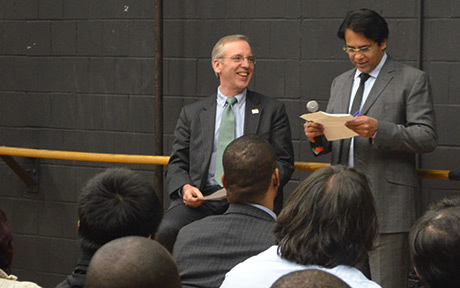 President Dudley with Dr. Gautam Sen, Dean of Lehman College's School of Natural and Social Sciences. President Dudley traveled to the Bronx to meet with business owners, public officials, representatives from community and economic development groups and the academic community. This trip marks the second time President Dudley visited the borough as part of the New York Fed's outreach efforts in the Second District. The last time President Dudley visited the Bronx was in October 2011. In contrast with that visit, President Dudley said that this time there is a much "greater sense of optimism" in the borough despite relatively high unemployment and low wages. He also noted that an important takeaway from this trip was the need to re-examine the application of the Community Reinvestment Act (CRA), which encourages banks to help meet the credit needs of the communities in which they operate, including low- and moderate-income neighborhoods. His visit included stops at OnForce Solar, a solar energy company, Montefiore Medical Center and WHEDco, a community development organization dedicated to restoring the South Bronx. Dudley also met with Bronx Borough President Ruben Diaz Jr. and the New York City Hispanic Chamber of Commerce. He ended the day with a "fireside chat" at Lehman College, where he answered questions from business and economics majors and faculty. The glass is half full...and I haven't said that in quite some time.